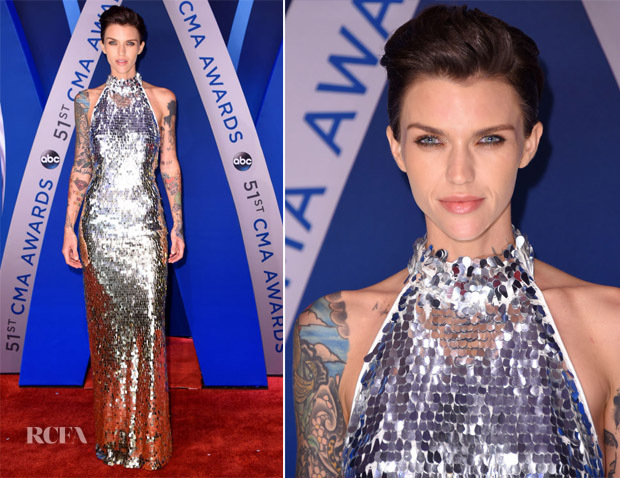 If you’re not a fan of all the frou frou dresses at the 2017 CMA Awards which took place on Wednesday (November 8) in Nashville, Tennessee, Ruby Rose has got you covered. The actress went against the grain wearing an August Getty Atelier Spring 2018 halter dress adorned with glistening silver and gold paillettes which was certainly deserving of its moment in the spotlight. Minimal styling kept the look chic while the open back adds contemporary impact.